A preview of the RyanElf cutout. APPLICATIONS HAVE CLOSED for seats at the Late Late Toy Show, but the organisers have put two tickets up for grabs as part of photobombing competition. Viewers are asked to go to www.rte.ie/latelate, download the ‘RyanElf’, print it, cut it out and start taking snaps with it for the competition. Viewers must then post their best #ToyShowSnap on Instagram, Twitter or The Late Late Show Facebook page. More than 125,000 applications have been received for audience seats for this year’s show, which airs on Friday 2 December. The application process closed yesterday, and RTÉ say tickets will be issued through a lottery. 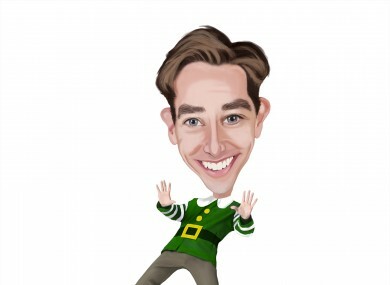 The real-life Ryan Tubridy said: ”Toy Show tickets are rarer than hen’s teeth and this is a great opportunity for someone to get their hands on two of them. I’m encouraging everyone to be as fun and creative as possible with the RyanElf – I’m looking forward to seeing where he ends up! RTÉ will collect the entries, which will go into a draw to win two tickets to this year’s show. Audience members must be 18 or over to attend on the night. Email “Want a Late Late Toy Show ticket? Take a pic with a cutout of Ryan Tubridy”. Feedback on “Want a Late Late Toy Show ticket? Take a pic with a cutout of Ryan Tubridy”.